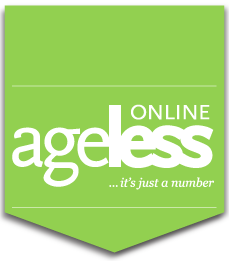 A 76-year-old recounts her early years, but it is her present doing voluntary guiding that she is most proud of. In the early days, when I was in my early 30s after I gave birth to my daughter and only child, I used to be telephone operator during the Vietnam War for about two years. Before I did that, I was helping my older sister as she was handling the laundry service for the US Army at three hotels – namely the Shelford Hotel on Shelford Road; Serene House, which is where Serene Centre is now; and Newton Towers at Newton area – during 1967. I was pregnant at the time and helped out as a clerk. I got to meet the Army boys and they were very nice. Sometimes, when they got promoted, they would have to change their strips on their uniforms and would ask me where they could go to remove their old strips and sew the new ones on. I would often end up bringing them home and asking my mom to help, earning me some pocket change! During my work, I found out through the manager of Serene House that they were looking for a telephone operator and I decided to quit my job and do that. There were three eight-hour shifts – morning, afternoon and night – so if I took the night shift, I would be off the very next day. There were two to three telephone operators including myself and the receptionist at the hotel would also help out. I was responsible for answering calls from the different rooms at the hotel and sometimes, the boys would call their friends in one of the other two hotels. They would also make overseas calls back home to the US. I was using the big, old switchboard where I would plug in and plug out to connect the calls, unlike today’s phones. These Army boys would come into Singapore for some rest and relaxation after fighting in the war. The majors and colonels would stay one week, while the Army boys would stay a few days. About 30 Army boys would come each week; one batch would go back to fight and another batch would come in. I remembered the manager of the hotel ended up going back to the US with a colonel or one of the boys and I kept in touch with her for a while. After the Vietnam War ended and the boys didn’t come back, I quit the job and decided to stay at home. At the time, my daughter was three or four years old. I then went on to do some babysitting (my husband at the time was a seaman) for two separate girls from 1983 till around 1995. After which, I did some on-and-off ad-hoc work in a clothing factory doing some administration and other work. 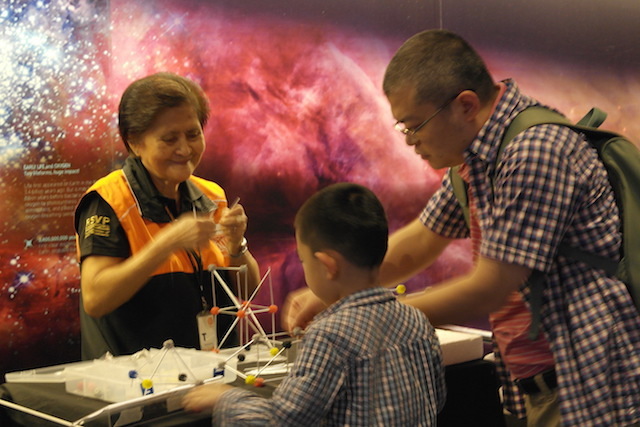 May volunteering at the Science Centre Singapore. It was in 1995 when I first started volunteering. My friend who was volunteering at Lions Befrienders said to me that since I was so free, why not do some volunteering. I said ok and together we distributed food to the elderly in the community and later, we befriended the community elderly once a week. I did this for 10 years. While I was volunteering there, I signed up to become a member of RSVP Singapore but was not very active. 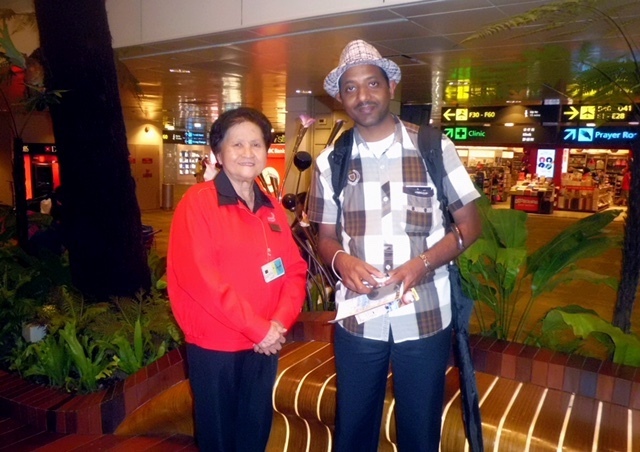 It was in 2007, when I got more active and joined the Changi Senior Ambassador programme at the airport, which I continue doing today. I do it once a week, guiding tourists and passengers in the airport who may be lost or need assistance. I remembered in 2007, there was a passenger from Estonia, who was on transit for less than five hours and wanted to go out of the airport. I had to explain to him that it was not possible, and going out and coming back would take more than the allotted five hours. He ended up submitting a positive feedback of me and I got a star for this! He also shared some interesting stories with me. I really enjoy guiding as I get to meet new people and make new friends. I also get to learn new things about the airport – did you know there is a swimming pool in Terminal 1 and at Terminal 3, there is a butterfly garden? I also volunteer for RSVP at KK Women’s and Children’s Hospital (KKH) doing patient guiding once a week, and some ad-hoc guiding at Science Centre Singapore and at URA City Gallery. I spend about four times on my guiding duties with each session being between three to four hours. Sometimes, I am also called upon to help at some RSVP events. If I stay at home, I will get bored as I don’t like watching TV in the daytime but more at night. I also get to learn when I volunteer especially more about Singapore; things I would normally not have known. For those who want to volunteer, you must be committed or else don’t do it. May volunteering at Changi Airport, guiding passengers and tourists. I am also happy when I volunteer. The people whom I help are very appreciative. Once there was this woman at KKH who asked me for directions to a ward as she was visiting her daughter who had given birth to twins. She told me she had been to the hospital before but forgot her way. She was very kind and kept thanking me. She also said she was lucky to have met me. These days, I want to cut down on my various volunteering activities as I am tired and busy with church and classes, and housework. Nonetheless, I still want to volunteer to the time when I am not physically able to. 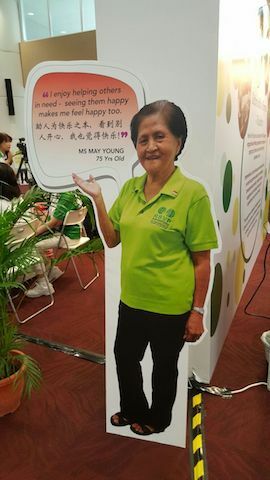 May Young was awarded RSVP Singapore’s Volunteer of the Year 2012 award and has been actively volunteering for the organisation since 2007.